Trick or Treating time is something I dread. Screaming children appear at my door and I must run an Olympic style hurdle event over the dogs to get near the door. Then I locate the chocolate (toxic to dogs, so it must be stored higher than any dog can reach), throw the door wide and reach through the open storm door window as the wails and banging are drowned out by the barking dog pack. Next, we all settle down for a a few brief moments and then repeat the show - for hours. I thought my idea to open just the storm door window was very clever, indeed. The dogs would not escape and some warm air might be salvaged. Unfortunately, the window that opened on my storm door was on the bottom. This worked out fine for the little kids but it puzzled the teenagers to have candy thrust out at knee level. No matter, this was a great idea - I thought. Then the flaw in my genius was revealed, as usual, by the dogs. The success of the whole plan depended on my ability to hurdle over the dogs and beat them to the glass door which separates the entry hall from the rest of the house. Once inside what we refer to as "the airlock", I could open the exterior door without dog interference. On one run, my timing was off and Earnest must have managed to stop the airlock door with his nose. I opened the door and lowered the basket. A group of pre-schoolers (just the right height for my demented set-up) reached in for the candy. Just then, the airlock door burst open and the three Cockers charged in. They made right for the candy - not my candy, but the candy in the bags the children were holding! Three Cocker heads flew out that open window, attached the candy sacks like feedbags to their muzzles and began grabbing and throwing candy over their shoulders. The children screamed and dropped their sacks. Parents dashed out of the darkness. I frantically threw the candy back out onto the porch. The children were pelted with their own treats as I yelled my apologies to the retreating families. 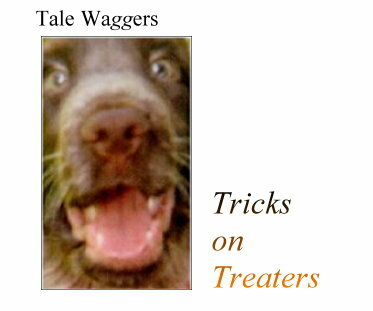 The dogs scattered, each with a mouthful of wrapped candy. I found Tristan in one corner recovering from a package of Sweet Tarts. He looked dazed. The wrapper was still in his mouth. Arthur was chewing pink bubble gum, but without lips, was unable to blow a successful bubble. Earnest had a Milky Way bar stuck to one ear and was busy eating the wrapper. The terrorized Trick-or-Treaters were a block away, wondering how a grownup could have betrayed their trust in this manner. It wasn’t my fault. All they’d yelled was "Trick or Treat".